NS8	is ready to help you get the answers you need. NS8	will reply to your questions about Get extension name	shortly. We appreciate your feedback about your support experience with NS8, developers of NS8 Protect. This helps us maintain high standards on the WooMarketplace, and helps NS8 improve. Glad to hear it went well with NS8. Tell us more. Did NS8 get back to you? Do you have any additional feeback for us or NS8? NS8 Protect for WooCommerce and WordPress uses industry-leading techniques in behavioral analytics, real-time user scoring, and global monitoring to identify bots and other malicious activity. As a platform-based approach to online threat reduction, NS8 Protect is designed to help your store fight the three big revenue killers: order fraud, advertising fraud, and poor performance. 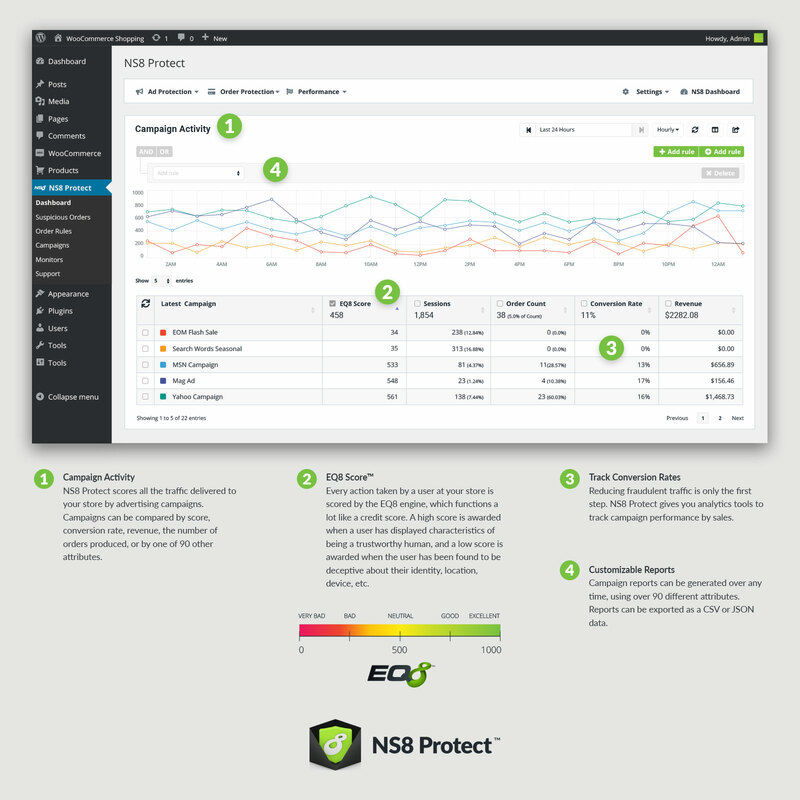 NS8 Protect scores every visitor to your storefront. Every action taken by the visitor leading up to and including placing an order is scored individually and reflected in the EQ8 Score. Low-scoring orders are most likely fraudulent and may be held or flagged for manual review. NS8 Protect also provides automated tools to escalate suspect orders or even request e-mail and SMS text verification from the visitor. The mix of automated tools and easier manual reviews empowers merchants to optimize their order processing and minimize risk. Benefit from the network of stores and websites already tagging fraudulent users and suspicious behavior by using NS8 software. Reduce costly chargebacks and the risk they pose to your merchant account. Reduce both the labor dedicated to manual review and shipping lead times. Set your own custom threshold for suspect orders and users. Advertising fraud (especially remarketing fraud) is a huge and growing issue for online merchants. NS8 Protect not only scores all traffic visiting your store, but it also detects and records the traffic’s source. You will see when, and which, advertising sources are delivering low-quality, high-risk, fraudulent traffic. You will be able to save money and increase revenue by eliminating poorly performing campaigns and focusing your budget on the successful campaigns that deliver results. Compare scored campaigns for the presence of bot traffic and fraud. Prevent bots and fraudulent users from being tagged for remarketing. Integrate with Google Analytics to tag high-value users for more effective remarketing. Track your store’s advertising savings from blocked fraudulent users. NS8 Protect includes 5 critical monitors that every WooCommerce and WordPress store should have. If and when an issue arises, escalating text messages are sent to you and your staff warning of potential or actual problems. Monitor your store’s technical performance. If your store becomes slow or unresponsive due to plugin conflicts or other changes, you will be immediately notified. Monitor your store’s global performance relative to other eCommerce stores. Monitor your store’s encryption certificates. If your store’s certificate expires, users will be warned against using your service. NS8 will alert you first, before the all-important certificate expires. Monitor spam and malware blacklists for your store’s domain. If your store finds itself listed, maliciously or accidentally, NS8 Protect will alert you and direct you towards a solution. NS8 Protect for WooCommerce and WordPress can protect you from the three biggest revenue killers. Get started today, risk-free, with your free 30-day trial. The installation requires no coding, and you can be collecting data and stopping fraud within minutes. NS8 Protect is a pay-as-you-go service, with tiered pricing based on your store’s traffic. * After the 30-day free trial period, pricing starts at $29.95 per month with the first price break starting for websites generating 500K hits or more a month. *Traffic is measured in hits: the total number of orders and page views that are analyzed on your website in a single month.